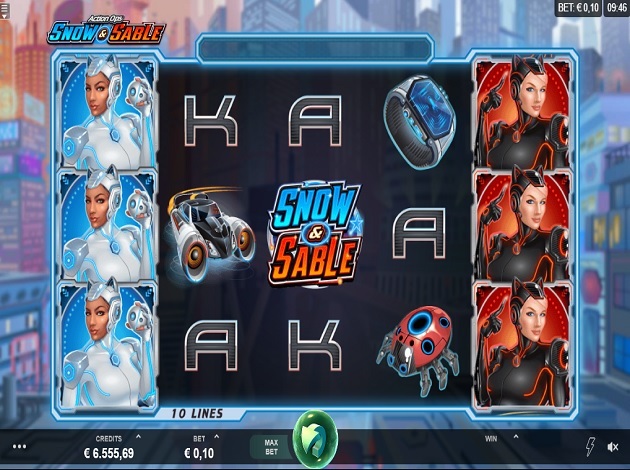 Action Ops: Snow & Sable is a five-reel slot with three rows and 10 fixed paylines containing a futuristic theme based on two partners in crime that go by the names of Snow and Sable. The two crime fighters are detectives that have important roles to play in this high-variance, crime fighting slot! Action Ops: Snow & Sable is produced by Triple Edge Studios who supplies unique and distinct content to Microgaming due to their exclusive partnership. With an impressive RTP of 96.03%, this action-packed game will make you feel like you are on the streets fighting crime yourself! Bets in Action Ops: Snow & Sable start from a minimum bet of € 0.1 and a maximum bet of € 100. As you may know, the two main characters of the game are Snow and Sable who also represent the wild symbols. Snow is dressed in a white full-length body suit while Sable is dressed in a black full-length body suit. These two partner-in-crime wild symbols can substitute for other symbols to complete winning combinations. However, keep in mind that, Snow substitutes for all symbols except for Sable and the scatter as well. Sable can substitute for all symbols except Snow and the scatter. There is a scatter symbol in this game and it is represented by an image of the slot’s own logo which says Snow & Sable written on it in blue and orange letters. Additionally, there are other symbols in this game that help Snow and Sable fight crime and they are a high-tech watch symbol, a robotic bug symbol, a futuristic car mobile symbol and a pair of high-tech red sunglasses symbol. Of course, there are also a few more general symbols which are also the lowest paying symbols in the game which are represented with A, K, Q and J. In Action Ops: Snow & Sable, the action is in the free spins feature where infinite free spins can be won with reels one and five both permanently wild. The free spins feature is triggered when you get three, four or five snow & sable logo scatters anywhere on the reels which will then award you with 10,15 or 20 free spins. During this feature, reels one and five become wild reels that randomly change between Snow and Sable, allowing you to more easily form five of a kind winning combinations. You can also add to your total of free spins by getting two or three scatters on reels which will give you five or ten additional free spins. Whenever you get a spin of three, four or five of the scatter symbols on the reels, whatever the position, you will receive in exchange 10 to 20 free spins, plus a reward which varies from 2x to 100x the stake. Snow and Sable are the highest paying symbols which totally makes sense since they are the two main fighting machines in the game! With either one of these two symbols, you can win up to 100x your stake! In the case that these two symbols create mixed wilds, you can still win up to 50x your stake. For the other symbols in the game, the futuristic car mobile is the highest symbol where you can win up to 25x your stake and after that is the creep-crawly robotic bug symbols which can award you up to 12x your stake. The high-tech red sunglasses can reward you with 8x your stake where as the high-tech watch symbol isn’t too far behind offering you up to 6x your bet. Now for the lowest paying symbols, the A and K can offer you up to 3x your stake while Q and J can reward you with 2.5x your stake! The theme of Action Ops: Snow & Sable is futuristic and goes hand-in-hand with the crime fighting duo. The game is based in a city which goes by the name of Aurora, all fictional of course. The music goes along with the theme perfectly; it’s subtlety mysterious as well as it is futuristic. It is rather captivating getting you in the mood to solve some mysteries. It also plays special enthusiastic music for when you land on winning lines. During the free spins round, the music picks up even more and whenever you land on a win, depending on which character is in play, their names will be said aloud! Action Ops: Snow & Sable is an action packed, futuristic slot that is a lot of fun to play! It literally lures you in to the crime fighting mode as you spin the reels to reveal your rewards! In this game you can win rewards for your help in fighting crime! The free spins round offers a chance to gain up to 20 free spins or even more depending on the winning combinations that you land which makes it a great way to get some epic rewards. If you are in the mood to fight some crime, your chance is here with Action Ops: Snow & Sable at Videoslots today. Triple Edge Studios is an independent casino game developer that has established a partnership with Microgaming which has been announced in 2018. This collaboration was made in hopes of supplying exclusive, distinct content from Triple Edge Studios to Microgaming.